A haulage company has been fined £510,000 and its company director has been ordered to do unpaid work after they admitted illegally storing baled waste. In 2014 and 2015, Winters Haulage Limited used a site next to Royston Sewage Treatment Works (STW) on the Hertfordshire/Cambridgeshire border to illegally store thousands of tonnes of baled combustible waste known as refuse derived fuel (RDF), posing a significant fire risk. Some waste was also buried at the site and stockpiled at another nearby location. At Cambridge Magistrates’ Court this week, District Judge Ken Sheraton said company director Liam Patrick Winters was “certainly reckless”, ordering him to carry out 180 hours of unpaid work as part of a 12 month community order. He was also ordered to pay £8,850 in costs. Judge Sheraton said Winters Haulage’s actions were deliberate and the company had no systems in place to prevent the offences. Of the £510,000 fine, £450,000 was the money saved or avoided by committing the offences. The company was also ordered to pay costs of £30,000. Illegally stockpiling thousands of tonnes of waste in this manner has potentially devastating impacts on the environment, communities and transport infrastructure. This case highlights the growing problems being faced with waste across the country and the result in court today should reassure the public that the Environment Agency is committed to bringing waste criminals to justice. Members of the public and those inside the waste industry who have knowledge of, or suspect illegal waste activity, are urged to come forward and report directly on 0800 807060 or via Crimestoppers on 0800 555111. The Court heard that Winters, aged 41, was responsible for Winters Haulage Ltd (now in liquidation), a waste management company which was based at Hunting Gate, Hitchin. The company had operated at the Hitchin address under an environmental permit, but operated the Royston site without a permit, which is required by law. When the Environment Agency told them to clear the site some of the waste was taken to a Biffa landfill site and some to the company’s Hitchin site (one of two large waste transfer stations operated by the company at the time) but the necessary accompanying waste transfer notes were either absent or incorrect. More waste was also left illegally at a nearby location known as Kings Ride, near Therfield, which was also not a permitted site. It was later discovered that some of the baled waste, known as RDF, had been buried at the Royston site close to the STW. Rebecca Vanstone, prosecuting for the Environment Agency, told the court that “burial of waste would never have been permitted”. The site is above a sensitive chalk aquifer and landfilling waste can only be authorised under a specific permit which requires the site to be engineered to strict standards to protect the environment. There was no evidence of contamination of the groundwater, Ms Vanstone told the court, but there would be a time delay while contaminants travelled to the groundwater so there was “a possibility of harm in the future”. 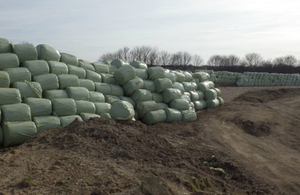 Mitigating for Liam Winters, Mike Magee told the court that early in 2014 Seneca Environmental Solutions Ltd, which runs an RDF production facility in Wembley, indicated that it could offer Winters Haulage a service to deal with its baled waste for transfer to Europe. However, Seneca was unable to take round bales as were produced by Winters at their Hitchin site. Winters used the Royston site to store the waste as a temporary measure until the RDF contract “kicked in”. Mr Magee said “Mr Winters never intended to undermine the statutory regime”. The Environment Agency served a statutory notice on the company stating that the site should be cleared, however the company failed to comply, despite having 4 months to clear it. Acting on information received, Environment Agency officers also visited a racehorse training site west of Royston known as King’s Ride, near Therfield. They saw 6 long rows of green-wrapped bales in a field and estimated there to be 450 bales. Some were ripped and revealed their contents to be mixed waste. The occupier and Winters Haulage were advised that the waste would have to be removed and the company later produced waste transfer notes stating that it had been taken to the company’s Hitchin site. During the investigation waste transfer notes for waste taken from Hitchin to Royston showed 60% was RDF, 30% was card and paper and 10% plastic. However, Ms Vanstone told the court that “the waste was mixed waste and there were no bales found that contained separate waste”. RDF (Refuse Derived Fuel) is residual waste that is often used as a fuel and can contain plastics, cloth, materials, and treated and untreated wood and is commonly baled using plastic wrapping which can degrade during periods of storage. Potentially polluting liquid can leak out and pollute the environment. Discrepancies in waste transfer notes, the use of number plate recognition equipment to track lorry movements of waste and officer observations all led to the conclusion that the company was acting illegally. Winters told investigating officers there were several clerical errors in relation to waste transfer notes which he had been unaware of. He said he did not know they needed a permit for the Royston site and did not think storing materials next to a sewage works was a bad place to store. He said there was no fire risk. After that conversation the company still moved bales from the Royston site without transfer notes. Officers became suspicious after the Royston site was finally cleared and the level of the land appeared to have changed, in some places by up to 1.5 metres. The ground was excavated and waste was discovered buried. In some areas landfill gas (hydrogen sulphide) was found. It was also discovered that the chalk bedrock had been excavated by up to 3.1 metres. Winters told officers that no waste was deliberately buried but that some may have been accidentally buried after some bales had split and the ground had been re-profiled to allow access due to the harsh weather conditions. On behalf of Liam Winters Mr Magee told the court “it was never his instruction to bury the waste”. The court heard that the site had not yet been remediated and it was estimated to cost the landowner, Anglian Water Group, £1.9 million to clean the site up to its previous condition. Cambridge Fire and Rescue Service assessed a risk of fire at the site and a plan was drawn up due to the risk of dense acrid fumes from a fire posing a threat to public safety. A Cambridgeshire County Council Emergency Plan was created involving 11 public organisations as the site was within 2.5km of schools, nurseries, sheltered accommodation, children’s homes, care and residential homes - all of which could have been at risk. The risk of polluting the groundwater would have been moderate to high from firefighting water run-off. An Environment Agency analytical chemist concluded that toxic substances could have been produced by a fire. Between 10 September 2014 and 19 December 2015 on land adjacent to Royston Sewage Treatment Works, Royston, Cambridgeshire Winters Haulage Limited did, with your consent, connivance or attributable to neglect on your part as a director of the said company, operate a regulated facility, namely a waste operation for the deposit, storage and disposal of waste, without being authorised by an environmental permit granted under Regulation 13 of the Environmental Permitting (England and Wales) Regulations 2010. Contrary to Regulation 12(1)(a), 38(1)(a) and 41(1)(a) and (b) Environmental Permitting (England and Wales) Regulations 2010. On or before 11 August 2015 on land at Kings Ride, The Thrift, Royston, Hertfordshire, Winters Haulage Limited did, with your consent or connivance or attributable to neglect on your part as a director of Winters Haulage Limited, deposit a quantity of controlled waste, namely baled refuse derived fuel waste, when there was not in force an Environmental Permit granted by the regulator pursuant to Regulation 13 of the Environmental Permitting (England and Wales) Regulations 2010 authorising the said deposit. Contrary to sections 33(1)(a), 33(6) and 157(1) of the Environmental Protection Act 1990. Between 10 September 2014 and 15 October 2015 Winters Haulage Limited failed to comply with the duty of care imposed by Section 34 (1) of the Environmental Protection Act 1990 in that as a person that carries, keeps, treats and disposes of controlled waste, Winters Haulage Limited failed to take such measures as were reasonable in the circumstances on the transfer of such waste to provide a written description of the waste in accordance with Section 34(1)(c)(ii) of the Environmental Protection Act 1990 and Regulation 35 of the Waste (England and Wales) Regulations 2011 and such failure was due to your consent, connivance or attributable to your neglect as a director of Winters Haulage Limited. Contrary to section 34(1)(c)(ii), (5) (6) and 157(1) of the Environmental Protection Act 1990. Between 10 September 2014 and 19 December 2015 on land adjacent to Royston Sewage Treatment Works, Royston, Cambridgeshire you did operate a regulated facility, namely a waste operation for the deposit, storage and disposal of waste without being authorised by an environmental permit granted under Regulation 13 of the Environmental Permitting (England and Wales) Regulations 2010. Contrary to Regulation 12 and 38(1)(a) Environmental Permitting (England and Wales) Regulations 2010. On or before 11 August 2015 on land at Kings Ride, The Thrift, Royston, Hertfordshire, you did deposit a quantity of controlled waste, namely baled refuse derived fuel waste, when there was not in force an Environmental Permit granted by the regulator pursuant to Regulation 13 of the Environmental Permitting (England and Wales) Regulations 2010 authorising the said deposit. Contrary to section 33(1)(a) and (6) of the Environmental Protection Act 1990. Section 34(1) of the Environmental Protection Act 1990 as a person that carries, keeps, treats and disposes of controlled waste, in that you failed to take such measures as were reasonable in the circumstances on the transfer of such waste to provide a written description of the waste in accordance with Section 34(1)(c)(ii) of the Environmental Protection Act 1990 and Regulation 35 of the Waste (England and Wales) Regulations 2011. Contrary to section 34(1)(c)(ii), (5) and (6) of the Environmental Protection Act 1990.